A snack mix that combines two crowd-pleasing flavors, buffalo and ranch. Need we say more! Are you ready to get your snackin’ on? There really isn’t all that much to say about this Gluten-free Buffalo Ranch Snack mix other than it’s flippin’ delicious. It’s one of those ‘once you start, you can’t stop’ foods. So the dietitian in me is going to suggest that you portion out a serving and seal the rest up to enjoy another day or share with others. Made delicious with a blend of gluten-free cereals, gluten-free pretzels, mixed nuts, ghee, ranch seasonings and buffalo wing sauce. Ummm…yum! A simple recipe that can be whipped up and in the oven in a matter of minutes. The combination of the ingredients baking away will have your home smelling delicious and your mouth-watering. 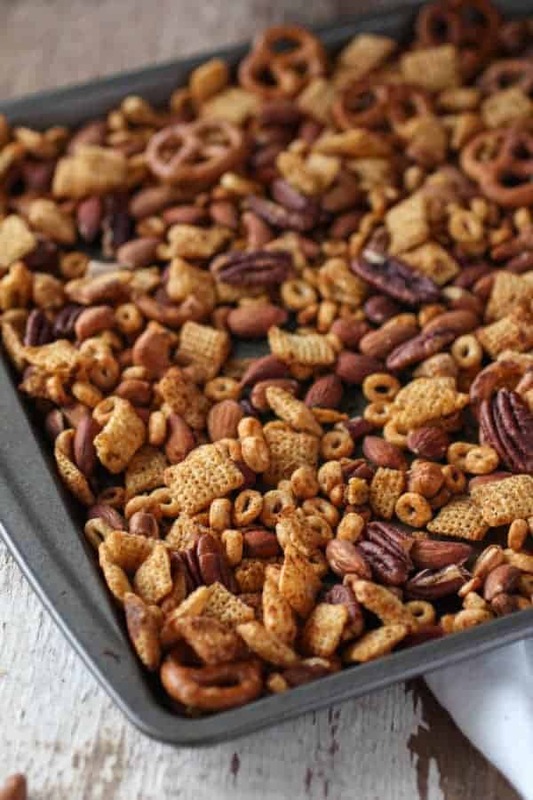 Once the baking time is up, the sampling of fresh out of the oven snack mix (after it has cooled for a few minutes) is quite a special experience if you ask me. The best! I can’t wait for you to try it too. Butter Ghee makes everything better! We like butter too, but we REALLY like ghee! Included in this recipe is our favorite ghee from Pure Indian Foods. The best of the best and made with pure passion. 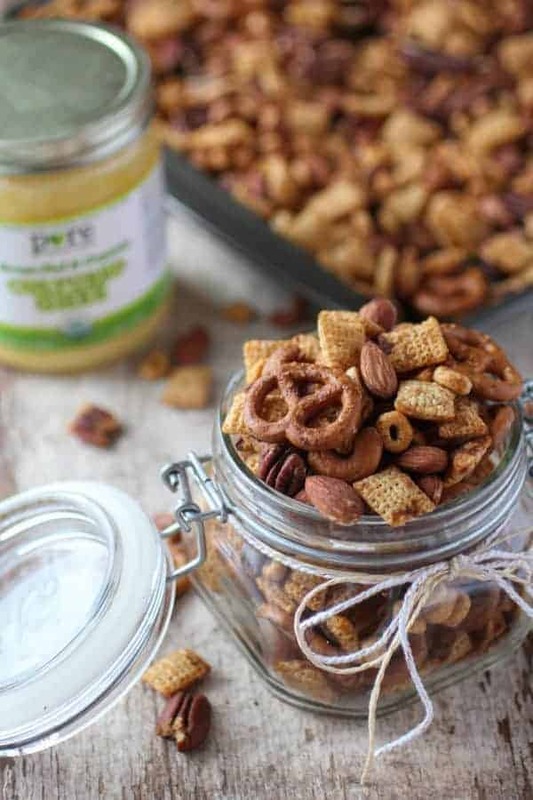 You really can’t beat the flavor and quality of this ghee and it adds such a nice yet subtle buttery flavor to this snack mix. Wondering what ghee is? 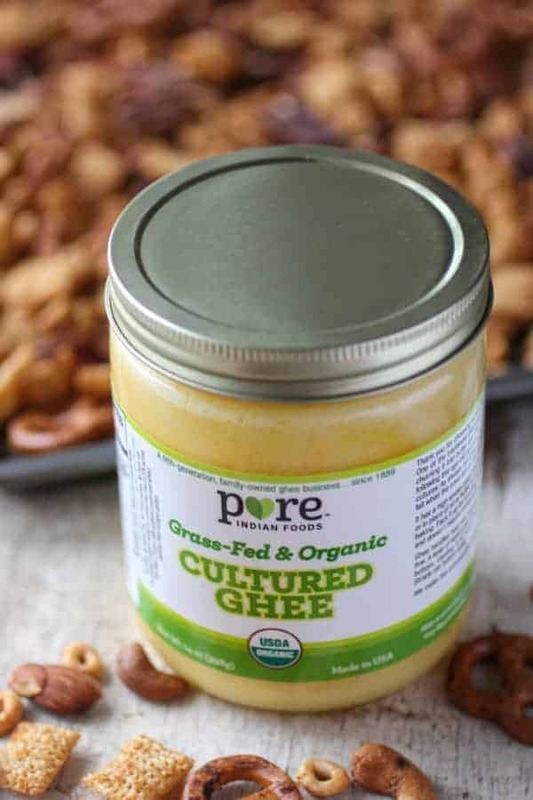 Here is a post that we shared called What is Ghee? You can learn all about it there. May sub coconut oil for a dairy-free/vegan option. Serve this Gluten-free Buffalo Ranch Snack Mix at your next Holiday party, as a game day snack or package it in mason jars for a special gift. This recipe is for all to enjoy! My husband was a quite a fan and requested a second batch so that he could bring it to work to share with his co-workers. We’ll see what those engineers think! If making this recipe for littles, I’d suggest going halfsies on the hot sauce and omitting the cayenne all together. Unless your kiddos like a little ‘kick’. 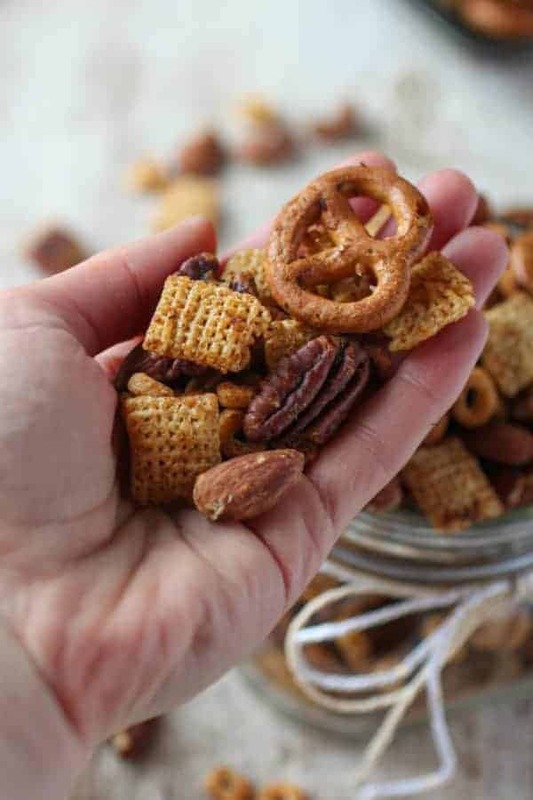 It’s now time to gather the ingredients so that you can give this oh so tasty Gluten-free Buffalo Ranch Snack Mix a try! 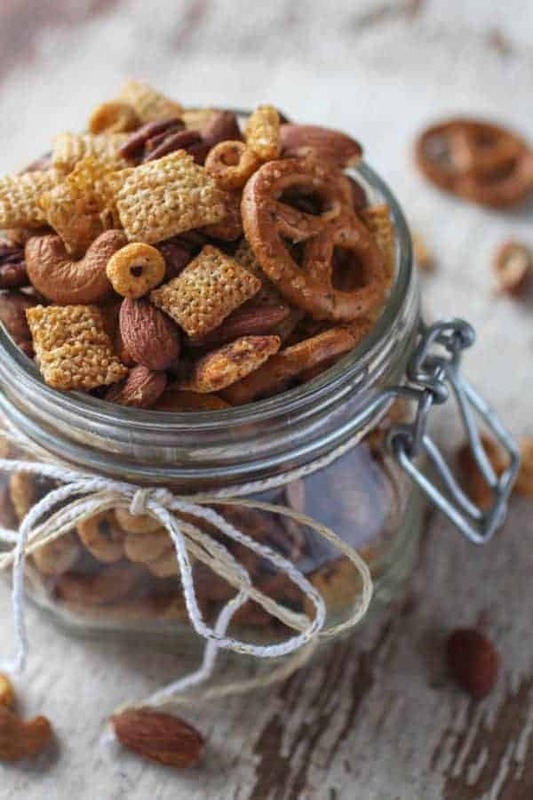 Gluten-free Buffalo Ranch Snack Mix is made delicious with a blend of gluten-free cereals, gluten-free pretzels, mixed nuts, ghee, ranch seasonings and buffalo wing sauce. Perfect for parties, picnics and get togethers. 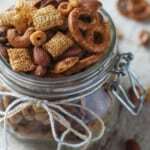 In a large bowl combine the rice chex, pretzels, nuts, and toasted oats cereal. Set aside. In a sauce pan on medium heat, combine the hot sauce, ghee, and seasonings. Whisk until ghee is melted. 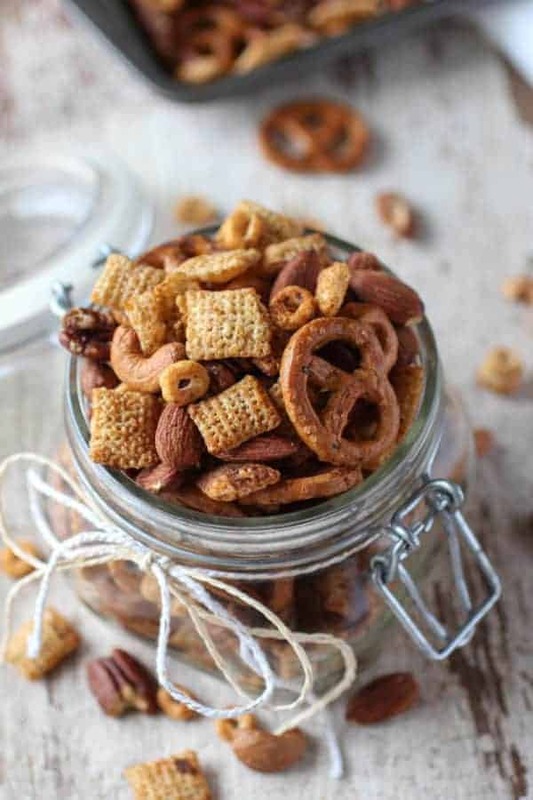 Pour sauce over snack mix and stir gentle to combine. Make sure all of snack mix is coated. Bake in over for 45 minutes or until toasted, stirring every 15 minutes. Remove from oven and let cool on pan. Once cooled, store in an airtight container. Comment below and let us know one of your ‘once you start, you can’t stop’ foods? Sounds like a yummy recipe! Should the mixed nuts be raw, or the already roasted, salted variety like Planters? You can use either one – use what you’ve got on hand! Enjoy!! Hi Erinn! You could definitely make it a week in advance. I just enjoyed the last of mine the other day and it was still good after 2 weeks! The perfect Christmas gift 🙂 Happy Holidays!